I’ve got a burning question: is it true that musicians are the kings (and queens) of flakiness? Like: why does it seems to me that nobody uses the word “energy” more loosely than musicians (OK, maybe Feng Shui practitioners, aging hippies, UN Eco-Popes, yoga teachers and crystal healers are energy fluff-aholics, too. But on the whole…)? For example, I’m a musician – just back from a vacation in my hometown of Winnipeg, Canada (“Spirited Energy” is the provincial slogan!) 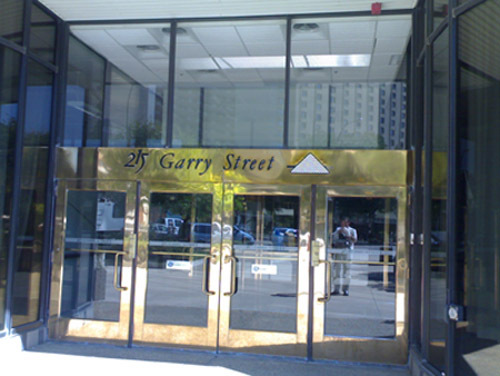 – and I’ll tell you this: whenever I go through downtown Winnipeg, I can’t help noticing an office building which really gives me the creeps. I mean, it’s all bad vibes. Yes, yes, “bad vibes”! Like that black monolith in Stanley Kubrick’s 2001! So, totally flaky? Or am I just oversensitive with regards to sinister-looking things, like those animals who go crazy two hours before a major earthquake? Probably. But I’m also a curious guy. Alright Ladies. I don’t want to be delving into Feng Shui or Ouija just yet. Rather, I’m going to consult a few muses, and see what they make of any “vibes” – real and imagined – emanating from this building. First muse: the science of acoustics, the link between music and architecture. Our key diagnostic tool will be the concept of harmonics. Harmonic and harmony share the same Greek root harmonia, meaning “joint, agreement, concord” (also a goddess in Greek mythology). In acoustics, harmonics are the basic over-tones or frequencies which, blending together in the vibration of an air passage, drum surface or string length, and make up the pitch (note) and timbre (sound “color”) of a given musical instrument. In music, tonal harmony is the set of tone relations that govern musical concordance and dissonance, based on scale patterns within the tonal key system. big-time flake makes important scientific discovery! While these concepts are the stock and trade of every serious student of music, I’m going to take an immediate historical turn, to garner the insights necessary for unwinding this foul-building plot. A bit of research on the origins of music theory shows that our Hard Science and New Age obsession over harmonics is admittedly of ancient origins. The earliest theories of music that have come down to us have come from Ancient Greek philosopher Pythagoras. 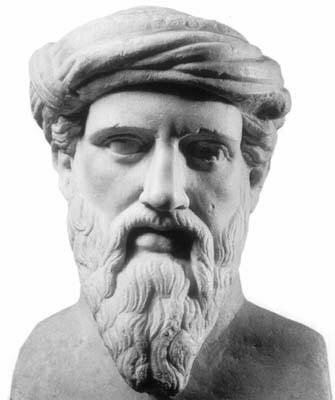 Pythagoras is famous for giving music theorists the basic concepts for understanding musical scale construction. He did this by dividing a plucked, resonating string into sections, and comparing the length of each section in relation to other tone pitches. From vibrating string sections, Pythagoras observed divisions that bore fractional relation to one another. Cumulatively, these vibrating segments came to be known as the harmonic series. By way of example: pressing down exactly in the middle of a whole string length would produce a tone exactly an octave above the open string. Pythagoras assigned the numerical ratio 2:1 to express this relationship between string division and tone pitch. The following graphic demonstrates the 2:1, 3:1 and 3:2 monochord ratios, using frequency measurements of Hz, or cycles per second. Every pitch value exists in relation to another. Even a single vibrating open string is expressed as 1:1 ratio. Laws govern harmonic relationships, which are to be expressed as numerical ratios. The western tradition of tonal harmony developed from the systemization of Pythagoras’ approach. Fair enough. But where does this take us with regards to our “building vibe” diagnostic quest? Actually, down the road to a much more ancient doctrine. What is often overlooked in our understanding of ancient music theory, is that Pythagoras attributed deep mystical value to numbers. His fully articulated doctrine – called Sacred Geometry – was considered an esoteric science for priestly or philosophical initiates only, and it is believed today that Pythagoras inherited and “secularized” this received body of mystical knowledge from Egyptian forebears. The following video documentary provides some fascinating (if not controversial) background research on the ancient mystery schools from which it is believed Pythagoras derived his initiation (watch from segment 6 onwards for an intro on “The Sacred Science”). If all this stuff seems rather far-fetched and esoteric to you, well… you’re right. 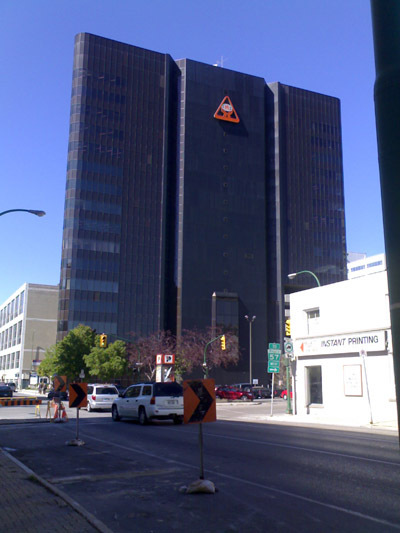 I mean, there’s a building in Winnipeg which gives me the creeps, and somehow I’m trying to relate my subjective impressions of this building to the mystery schools of Ancient Egypt! So perhaps I should begin making my point ;-). One of the reasons people take to learning a music instrument is the ability to express themselves through song and music. Concretely, that means learning to produce harmonious, melodic and rhythmic vibrations with their musical device, in keeping with the stylistic laws of any given musical genre. In this way, just as I’m instinctively repelled by this building, I am subconsciously attracted to my instrument, knowing it is designed for creative harmonic purposes. Indeed, if there’s one (flaky) thing we can derive from this “Sacred Science of Geometry”, it is that harmonics are universal. Everybody knows the clichÃ©: “music is the universal language of humankind”. But scientifically speaking even rhythmic devices, such as a single drum resonate with harmonic frequencies. 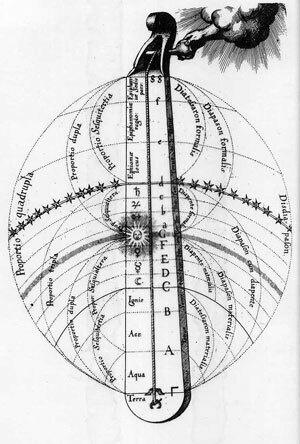 So in a way, it seems the only difference between us and the ancients is that the ancients thought all things to be imbued with “mystical resonances” (harmonics), from the smallest being in the microcosm to the largest of celestial bodies. So in effect, what am I doing? I’m just putting on an ancient mask to better sniff out some contemporary bad vibes. Like Frank Albo, Manitoba’s most recent academic celebrity, now a celebrated architectural harmonics inspector. For those of you who haven’t heard of him, Frank has made a name for himself as expert in local esoteric lore in Winnipeg, with his landmark research on the Freemasonic origins of the Manitoba Legislature. Here’s a televised segment of Frank doing a “magical mystery tour” of the legislature (apologies for the appalling hipness displayed by the show hosts). Of interest to us: there’s a neat demonstration of architectural harmonics in the final bit of the segment. 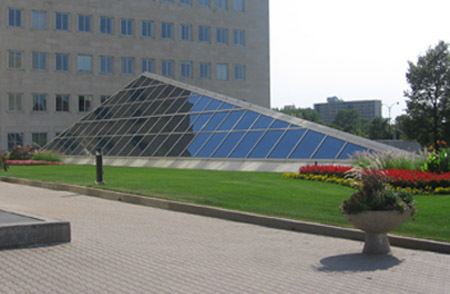 and what about glass pyramids? So in the end, can Frank’s research methods provide me with the key to my local bad vibes diagnostic quest? Well, if bad industrial design remains the main criteria for determining whether a building has Sick Building Syndrome or not, perhaps flaky musicians such as myself must ultimately have recourse to architectural harmonic assessments, as self-defense against psychically noxious sites. ‘Cause, unless you’ve got that special ear training, you’ll never really know when your local glass pyramid will spontaneously shatter. This is really neat, thanks for the insight. Did you notice the Great West Life building has the 3 kings on top of the entrance, and the west side of the legislative building has a sphinx… like a mini-model of the great pyramid in Giza during the winter solstice. I’m wondering if this is of any significance? Thanks, hadn’t noticed those kings! From what I’ve gathered so far on this stuff, the three Kings (three wise men) are allegorical representations of three brightest stars in the belt of the Orion constellation. Apparently, what’s of esoteric significance is the way the alignment happens, in the calendar cycle, in connection with the Winter Solstice. On Dec 24th, Sirius (the “Star in the East” in the Bible) aligns the Three Kings, thereby announcing the rebirth of the Sun cycle, after it’s lowest ebb in Winter Solstice. You’re correct to note that the great pyramid also is connected with the Dog Star. You probably have Frank Albo’s book on the legislature, he’s pretty much my source on info on Winnipeg hermetica lore. 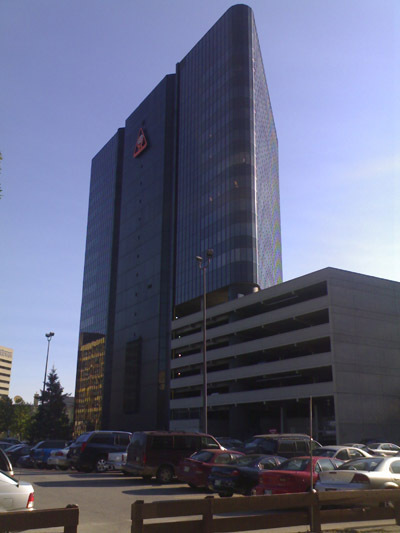 Certainly, the Great West Life building also qualifies as a bad vibe bunker in my books. Designed by the same crowd. Powered by inkzine Theme. © 2019 amateurmusicians.net. All Rights Reserved.